The Pear Eating was once again well attended with 48 people enjoying an evening of fun and entertainment. 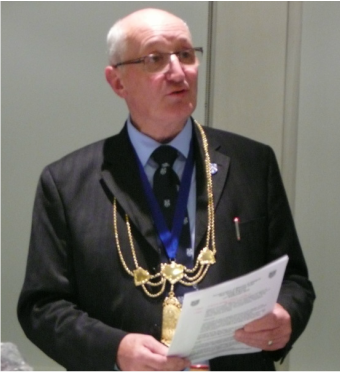 This was the second year in a row that Deacon Craig R Bryce had the pleasure of conducting the evening and he was delighted that he did not have to sing the Besir Song or present the company with Besir Bryce's Blairlogie Raspberry Jam in compensation for not singing. The traditional rustic fare of sausage rolls; pies and sandwiches was washed down by ample supplies of beers and wines. The Besir's cake made an excellent dessert after the main course. The Pear Eating was attended by many Past Masters, Members of the Master Court, Deacons of the 2013/14 and 2014/15 Chain Gangs and Mr Bill Gloyne the Master of the Worshipful Company of Masons of London. Mr Fraser Paton, our New Laid Stane was also present and he was introduced to the company for the first time. During the meal the company was entertained by the pianist Mr Kitchen playing a selection of tunes which set the tone of the evening. After the meal there was the usual speeches and interludes of singing, pipe music and funny stories. Everyone the evening contented after having a very enjoyable end to the Trades House year. Collector Gary Smith introduced Ian Macpherson who led the singing and performers of the evening. David Harrison, Deacon of the Hammermen was slightly surprised to be asked to perform and he upheld the honour of the Hammermen magnificently. Past Deacon Ian Smith was magnificent on the pipes which led the singing of "The Rowan Tree" and "Maries Wedding". Other performers also took part and all helped to make the evening a night to remember. In the absence of the Incorporations' Auldest Deacon, James Hamilton Smith, David Dobson told the story of the Pear Eating. He had his own imitable style and the only way to learn the story is by attending the great evening. Tom Monteith, Clerk to the Incorporation of Masons recited a humorous poem describing the Deacon's year and which gently poked fun at the Deacon, much to the amusement of the audience. Late Deacon Brian Evans toasted the Deacon (he claims for the 58th time) and revealed some of his hidden secrets. The evening was closed in the traditional manner with the Auldest Deacon Present, Past Deacon David Orcharton "Rapping the Shed". David related the story of how this custom came into being and its significance to the Incorporation. On leaving the hall, every one picked up there two pears and white heather, which was worn the following day at the Deacons Choosing meeting and the Deacons Choosing Dinner. nt retired to the Steps Bar for a final libation after a very enjoyable and successful evening.